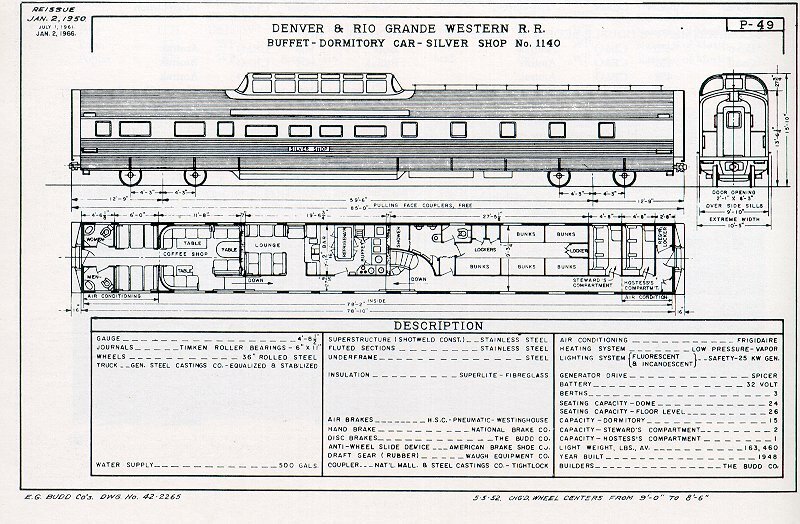 Floor Plans -- Originally appeared in Railroad Model Craftsman and drawn by Julian Cavalier, adapted by John Wilson. Copyright Carstens Publications Inc., used by permission. Note: This file is formatted to print on 8"x 10.5" paper. In order to keep labels and dimensional data readable this is a LARGE 201kb file. 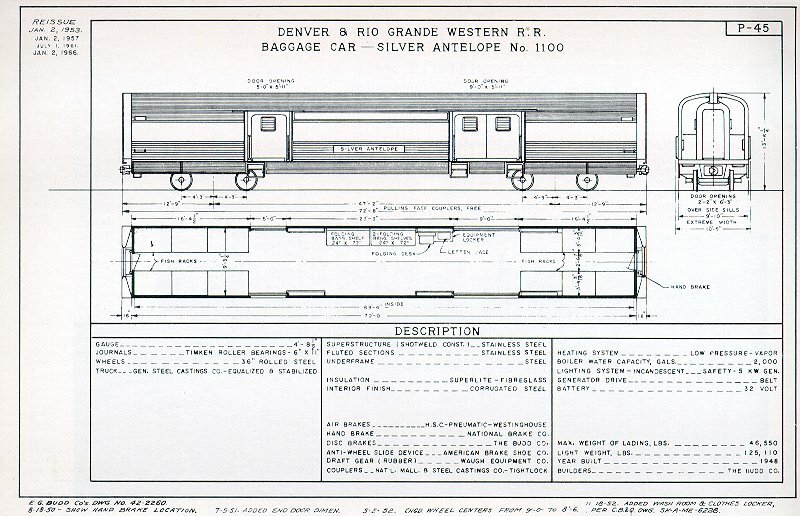 Official Budd Drawings -- for the Rio Grande's Silver Antelope. 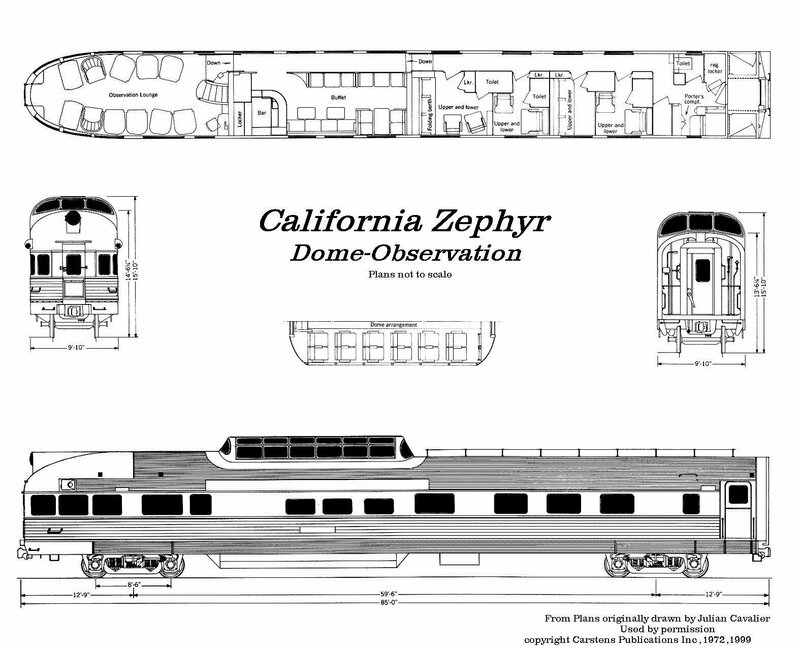 Floor Plans -- Originally appeared in Railroad Model Craftsman and drawn by Julian Cavalier, adapted by John Wilson. Copyright Carstens Publications Inc., used by permission. Note: This file is formatted to print on 8"x 10.5" paper. 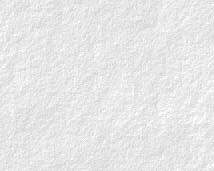 In order to keep labels and dimensional data readable this is a LARGE 291kb file. 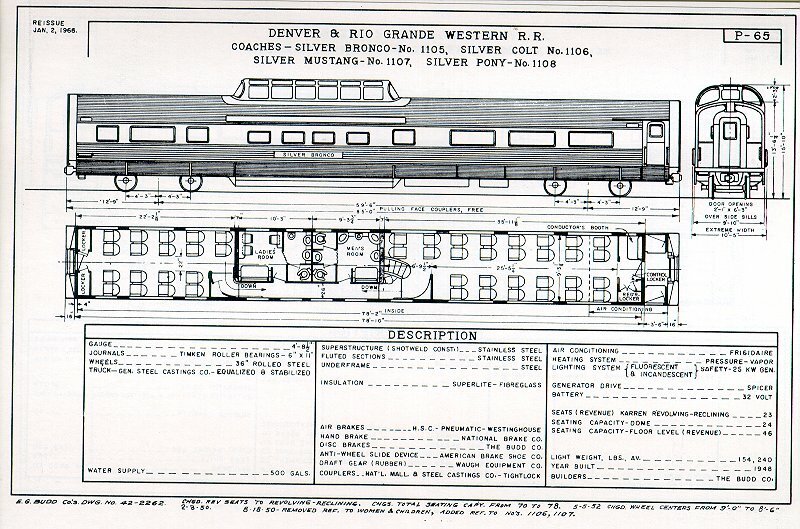 Official Budd Drawings -- for the Rio Grande's Silver Colt. 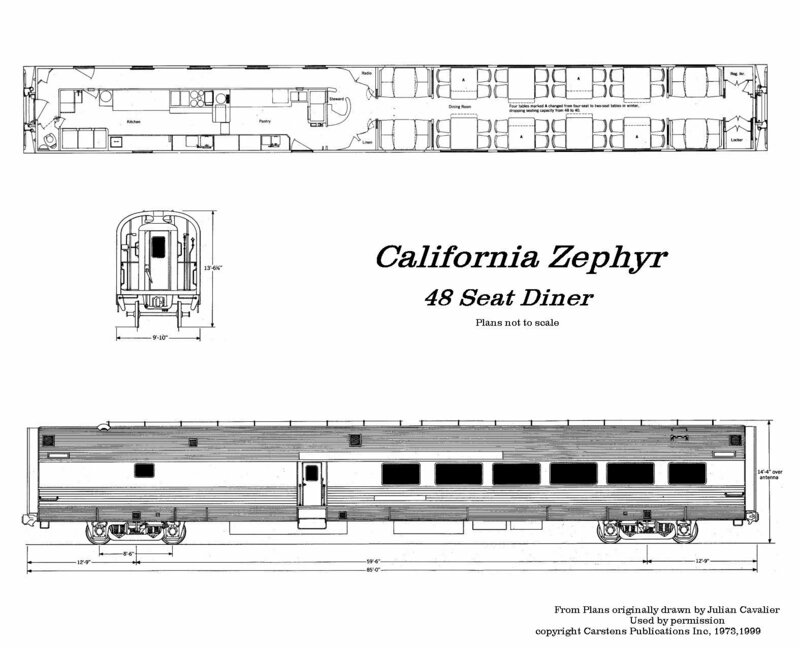 Floor Plans -- Originally appeared in Railroad Model Craftsman and drawn by Julian Cavalier, adapted by John Wilson. Copyright Carstens Publications Inc., used by permission. Note: This file is formatted to print on 8"x 10.5" paper. In order to keep labels and dimensional data readable this is a LARGE 325kb file. 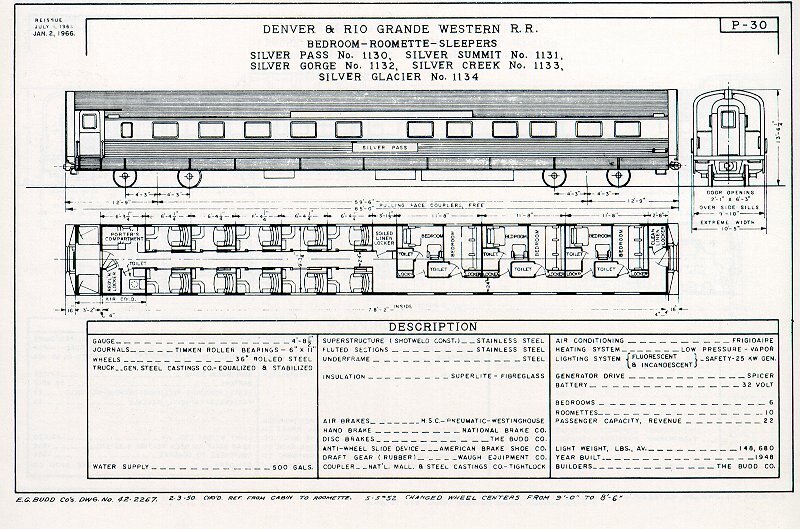 Official Budd Drawing -- for the Rio Grande's Silver Shop. 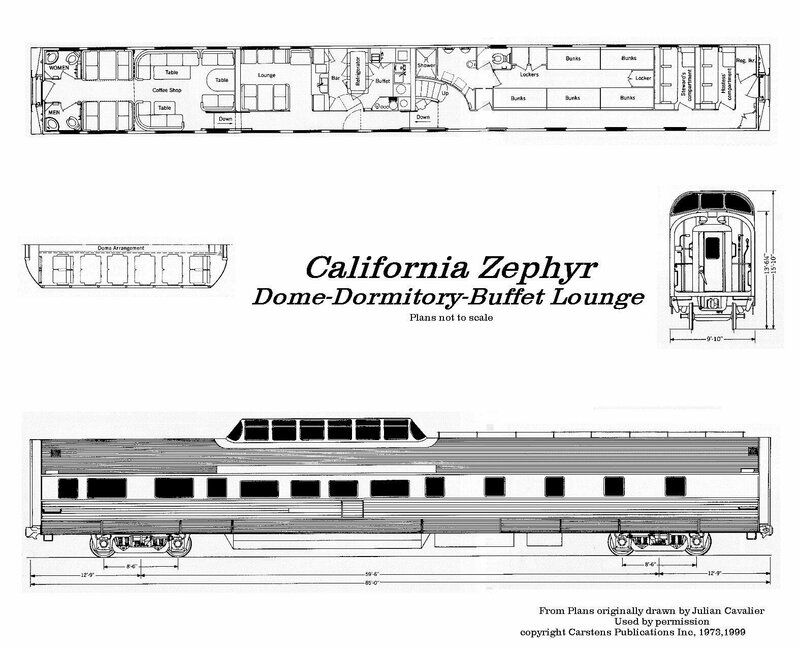 Floor plans -- Originally appeared in Railroad Model Craftsman and drawn by Julian Cavalier, adapted by John Wilson. Copyright Carstens Publications Inc., used by permission. Note: This file is formatted to print on 8"x 10.5" paper. In order to keep labels and dimensional data readable this is a LARGE 255kb file. 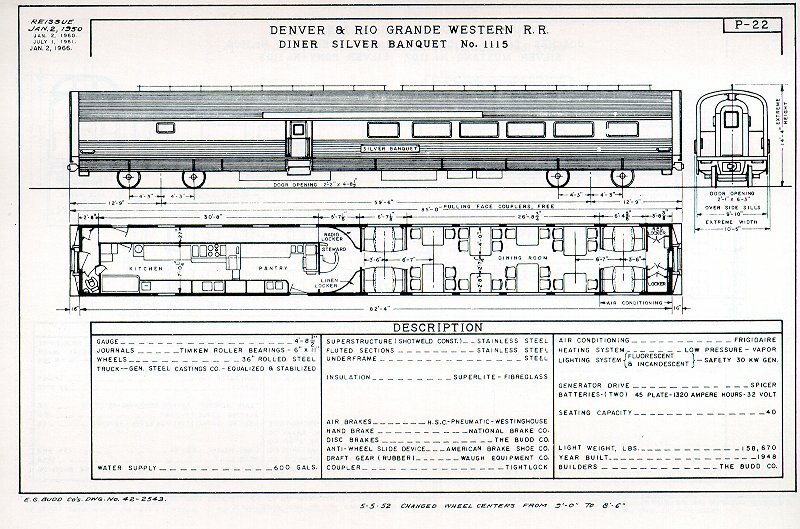 Official Budd Drawings -- for the Rio Grande's Silver Banquet. 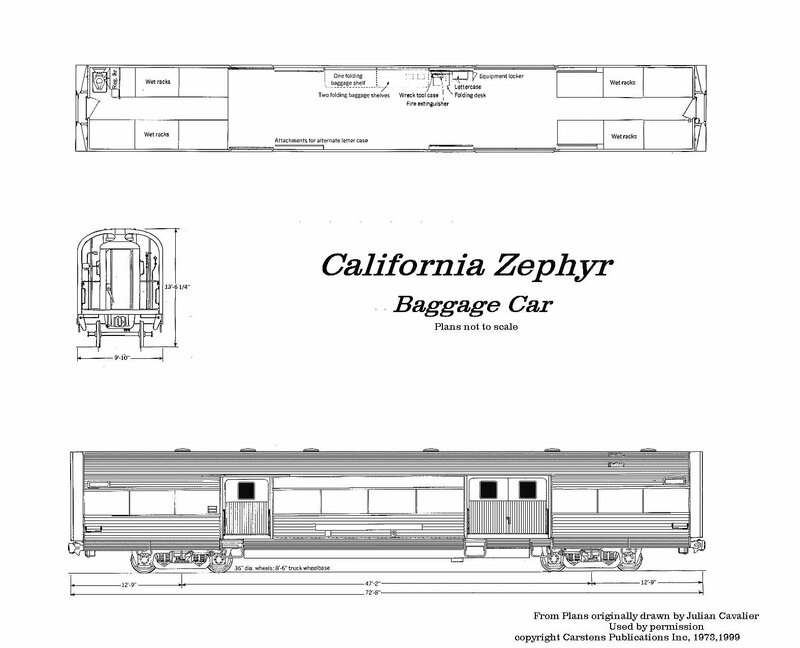 Floor Plans -- Originally appeared in Railroad Model Craftsman and drawn by Julian Cavalier, adapted by John Wilson. Copyright Carstens Publications Inc., used by permission. Note: This file is formatted to print on 8"x 10.5" paper. In order to keep labels and dimensional data readable this is a LARGE 246kb file. 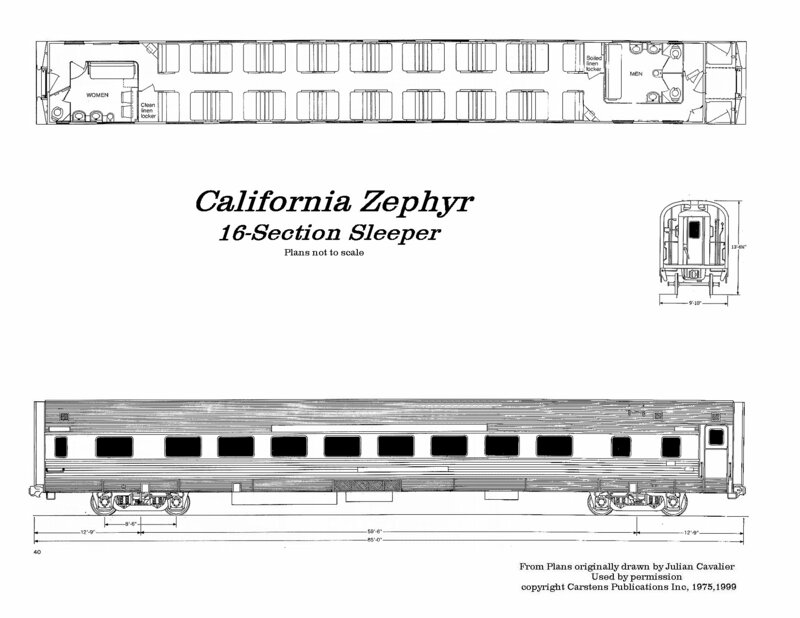 Revised Budd Drawings -- Edited Budd drawing illustrating the original 16 section sleeper configuration. 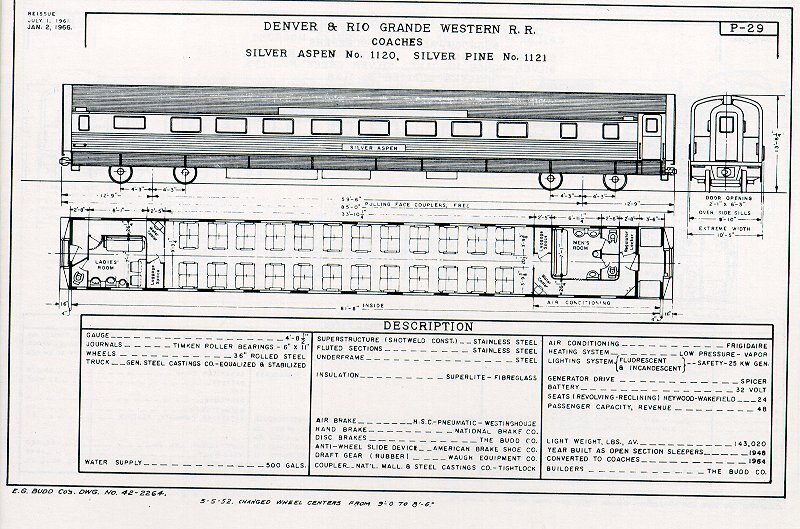 Official Budd Drawings -- for Rio Grande's Silver Aspen. 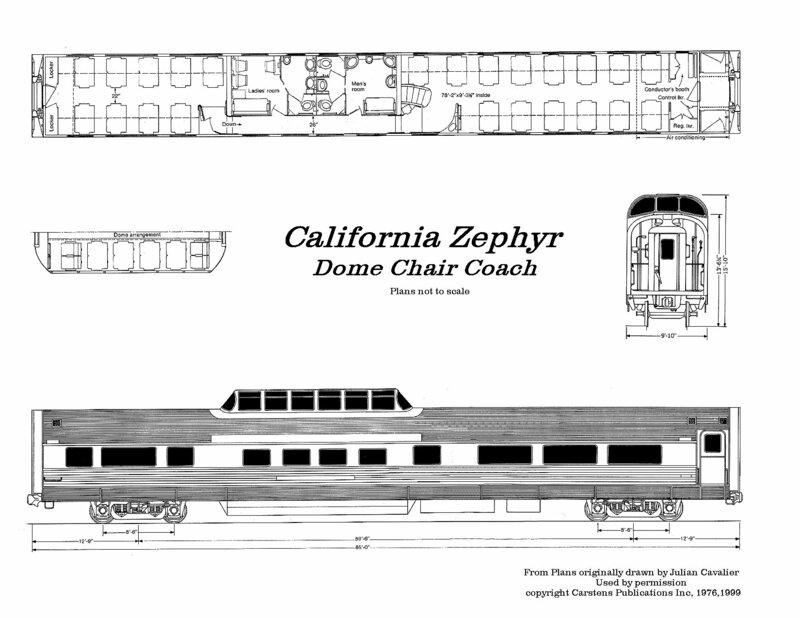 This drawing illustrates the car's layout when later reconfigured into chair coaches. 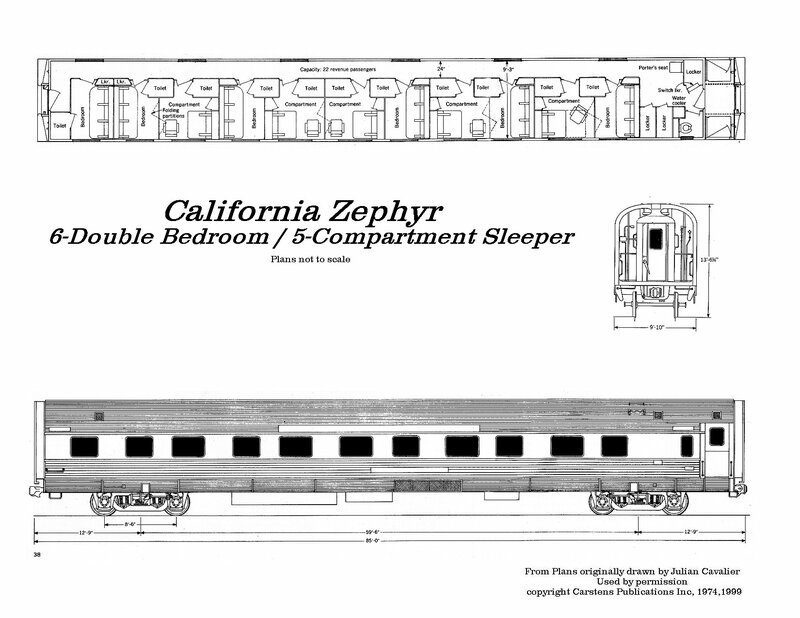 6/5 Sleeper Floor Plans -- Originally appeared in Railroad Model Craftsman and drawn by Julian Cavalier, adapted by John Wilson. Copyright Carstens Publications Inc., used by permission. Note: This file is formatted to print on 8"x 10.5" paper. In order to keep labels and dimensional data readable this is a LARGE 294kb file. 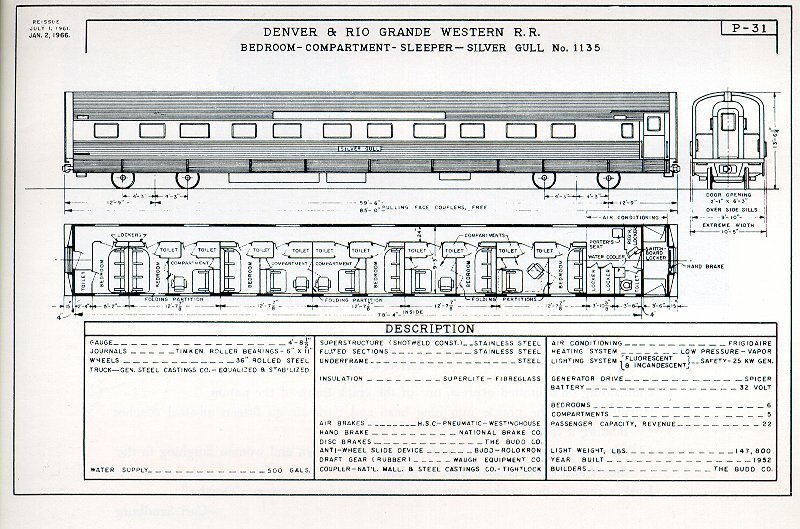 Official Budd Drawings -- for Rio Grande's Silver Gull. 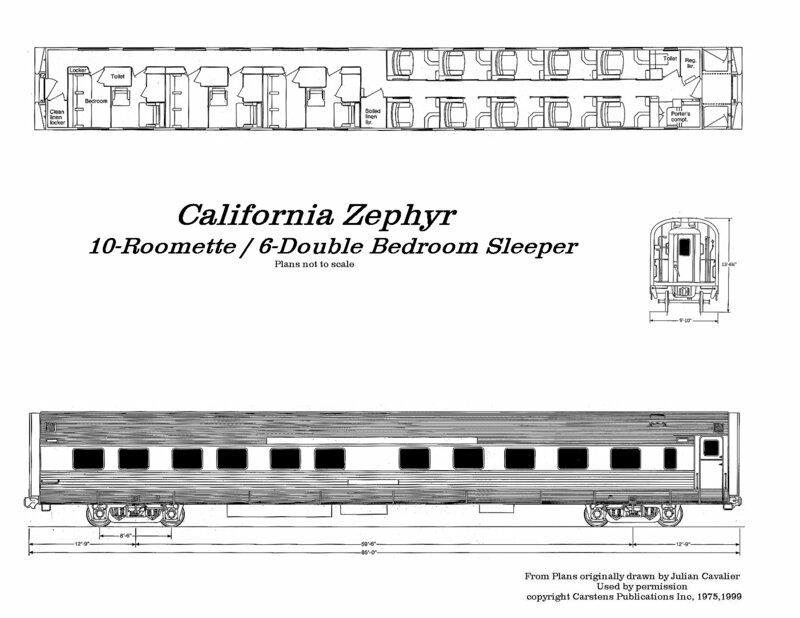 10/6 Sleeper Floor Plans -- Originally appeared in Railroad Model Craftsman and drawn by Julian Cavalier, adapted by John Wilson. Copyright Carstens Publications Inc., used by permission. Note: This file is formatted to print on 8"x 10.5" paper. In order to keep labels and dimensional data readable this is a LARGE 272kb file. 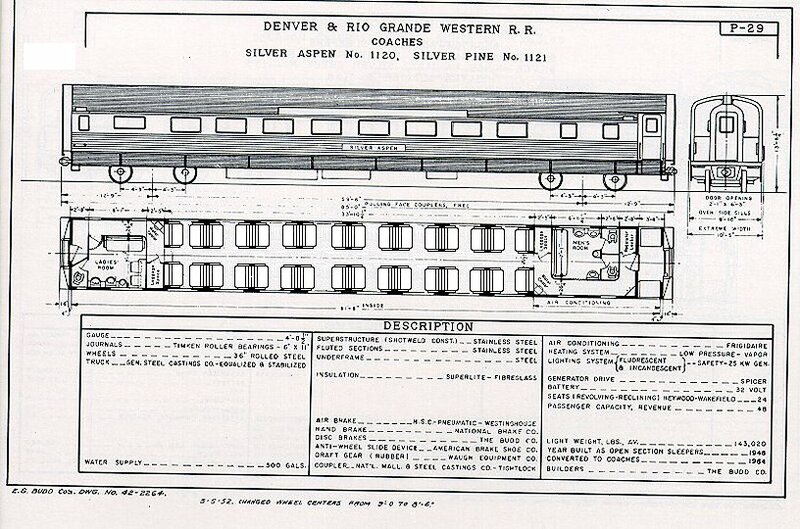 Official Budd Drawings -- for Rio Grande's Silver Pass. 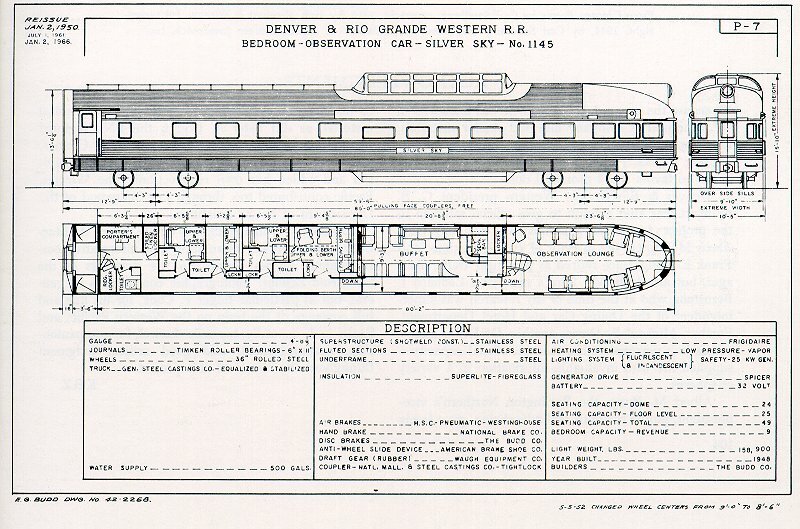 Official Budd Drawings -- for Rio Grande's Silver Sky.